The L train, connecting Manhattan with Brooklyn’s hip neighborhoods of Bushwick and Canarsie, carries 225,000 people on an average weekday. At some point in the next few years, it’ll have to be completely shut down for repairs. It’s in a dangerously bad state. Here’s why, and how it’ll be fixed. New York City’s Metropolitan Transit Authority, which runs the subway system, has gotten a lot of flack for its determination that it absolutely must cut off an important city artery, just when the hedge funds that bought many of the affected properties were hoping to for a pay day and/or disrupting the lives of many hundreds of thousands. So the MTA made this video in response, explaining that no, it isn’t just a bunch of incompetents impotently blaming its own riders for mysterious problems. 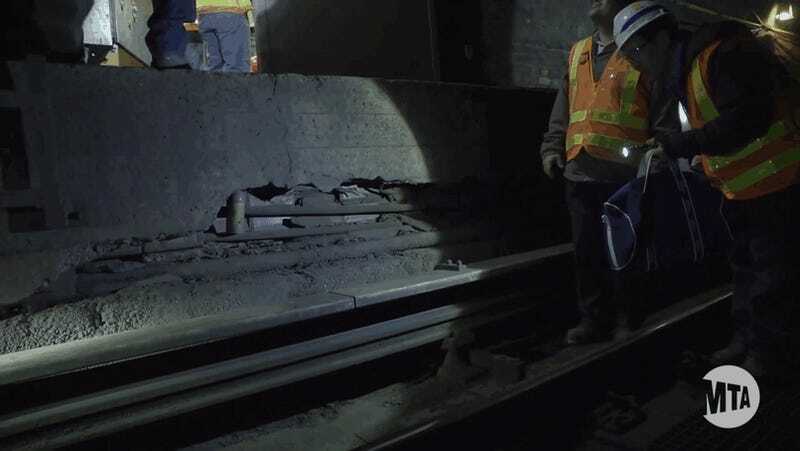 Many of the issues it’s encountering are real, ranging from a 92-year-old cast iron tunnel that was entirely filled with corrosive seawater, to wiring tubes that were filled with cement-like silt, to silica dust that could kill workers and riders alike. All of it was thanks to the combination hurricane/Nor’easter that was Superstorm Sandy, and it looks to be a nightmare. The scale of the damage is nothing short of catastrophic, and the temporary fixes used to keep the tunnel working ever since that October evening in 2012 won’t hold forever. There are two scenarios currently being contemplated for all the work, and neither is especially pretty.. The first one would entail shutting the tunnel down in both directions, effectively cutting off large swaths of north Brooklyn entirely, for a year and a half. The second second would entail shutting the tunnel down in one direction at a time, spanning a total of three years, which would enable limited – but still extremely crippling – service. The MTA is being upfront, too, about just how bad it will be even in a best-case one-track-at-a-time scenario. Service will be “infrequent and unreliable,” with only one in five people who want to use the Brooklyn-Manhattan connection will actually able to do so, thanks to “extreme crowding” and long waits. The most optimistic among us are hoping that extra bus and ferry service will help pick up the slack, but if we’re being candid, New York’s infrastructure is already incredibly overtaxed. Throwing more riders over to those other connections may just end up sowing chaos. But if you live in Williamsburg, Brooklyn, don’t worry. The earliest work will start is 2019, so there’s still time to offload your apartment onto the next sucker from Ohio.